Many Korean apartments and condos do not have ovens (as many expats discover after moving to South Korea). Having to adjust to cooking without a major appliance can make it life in the “Land of the Morning Calm” difficult if you enjoy baking. 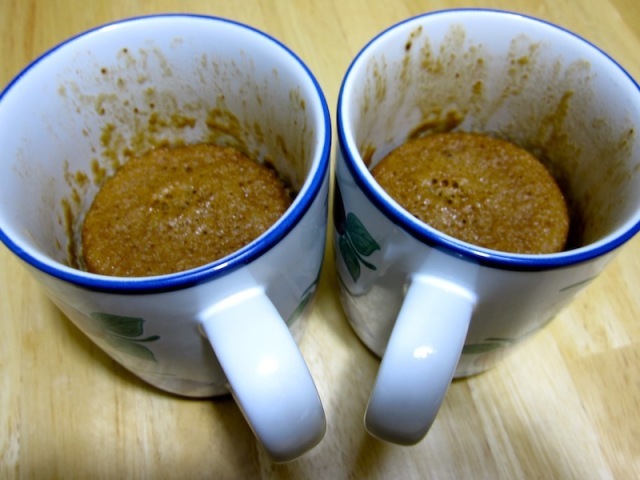 This is a cake recipe you can make in your microwave in a coffee mug. It’s very easy, since it makes only two servings. The touch of Korean pepper powder invokes chocolate’s ancient past as an elixir of Aztec royalty. You can find the original version of this recipe here. Cut it in half if you’re making a solo treat. 1. Mix all the dry ingredients in a big bowl. 2. Next, add in the milk, oil, vanilla extract, egg and mix well. 3. Pour mixture into mugs (at the halfway mark). 4. Sprinkle the top with the extra tablespoonful of chocolate chips or flakes . 5. Microwave one mug at a time. Cook for 1 minute on medium heat. It will bubble and rise as it cooks, so make sure you provide ample room for that. Leave it for a few seconds, then microwave for another 30 seconds on medium again. The mixture will solidify, but still look a little molten. That is fine because it will continue cooking on residual heat. Overcook it and you get a chocolate rubber ball. 6. Allow to cool a little before serving. The chocolate chips will sink to the bottom for a chocolate syrup treat. Think of it as the icing on the bottom instead of the top. As you can see from the photos, the end product looks a little messy (after all, you’re serving it in the same dish you made it) but a generous scoop of your favorite ice-cream will hide that perfectly.